We offer following Vedic Astrological Services, covering almost all parts of Indian Astrology. Based on ancient Vedic Indian astrology. Get your detailed reading and interpretation. And horoscope reading with predictions, which will expose you to Vedic astrology and describe the various aspects of your life such as Family life, Money matters. Ask any questions covering career, money, love children, property, losses, business, inheritance, family, partnerships, evil sprits, health, investment or new plans. 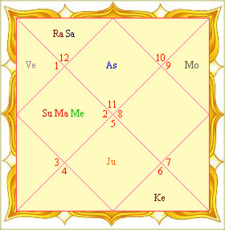 Vedic Astrology has solutions to bad planetary effects . Mantra, Gems & Tantra- as required to counter the ill effects of Planets. Like property, Children, Losses, Inheritance, Partnerships, and any other area of question. Horoscope Consultation on any specific areas of concern.